The invention of the modern computer keyboard can be traced back to the invention of the typewriter. So, who invented the typewriter? As with many other modern machines, like airplane, automobile, telephone, television, etc., a number of people contributed insights and inventions that eventually resulted in a commercially successful product, the same happened with the invention of the typewriter (and the computer keyboard). First (known to us) was Francesco Rampazzetto (1510-1576), Prior of the Guild of Booksellers and Printers in Venice (Venezia), who invented in 1575 the scrittura tattile, a machine to impress letters on paper (it seems the machine was an auxiliary device for the blind). Then we meet the Englishman Henry Mill (1683-1771), a waterworks engineer in the New River Company (which managed the New River—an artificial waterway in England, opened in 1613 to supply London with fresh drinking water). Henry Mill was a holder of two English patents—№376 from 1706 and №395 from 1714. The first was for Springs for Coaches, Chariots, and other Vehicles (some kind of a shock-absorber). The second patent (dated 7 January, 1714) was for Machine for Transcribing Letters, which appears to have been quite similar to a modern typewriter. The patent stated: …Our Trusty and welbeloved Henry Mill, gent., hath by his petitcon humbly represented, that he hath by his great study and paines and expence invented and brought to perfection an artificial machine or method for impressing or transcribing of letters, one after another, as in writing, whereby all writing whatsoever may be engrossed in paper or parchment so neat and exact as not to be distinguished from print; that the said machine or method may be of great use in settlements and publick records, the impression being deeper and more lasting than any other writing, and not to be erased or counterfeited without manifest discovery. We don't have a drawing of the machine and there is no remaining record that Henry Mill actually built it. The first working model of a typewriter was made by the Italian Giuseppe Pellegrino Turri, a noble and skilled mechanic, in the early nineteenth century. Turri also invented carbon paper to provide the ink for his machine. Almost nothing is known about the machine, but some of the letters written on it have survived (16 letters are preserved in a museum in Reggio Emilia). According to the legend, Pellegrino Turri had fallen in love for the beautiful Countess Carolina Fantoni da Fivizzano (1781-1841), a nephew of the Italian poet Labindo. Slowly, the young contessa's vision blurs, distorts, and fades. So, in hope of improving her illegible writing and to enable her to correspond with her friends (including him) in private, in the beginning of 1800s Turri crafted a machine made of keys and metal arms tipped with raised characters. When the Countess pushed a key, an arm struck a piece of carbon paper atop a sheet of paper. According to another version, the machine was invented in 1802 by Carolina's brother, Agostino Fantoni da Fivizzano (1777-1847), to help his blind sister, while Turri, only improved Agostino's machine and invented the carbon paper in 1806. 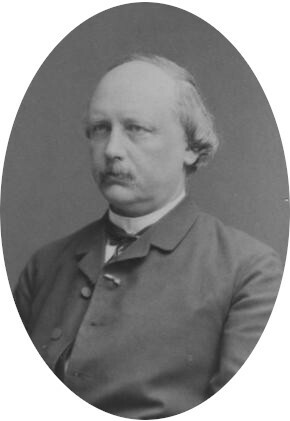 The world's first commercially produced typewriter (see the upper image) was developed in 1865 and first patented and put into production in 1870 by Danish pastor Rasmus Malling-Hansen. 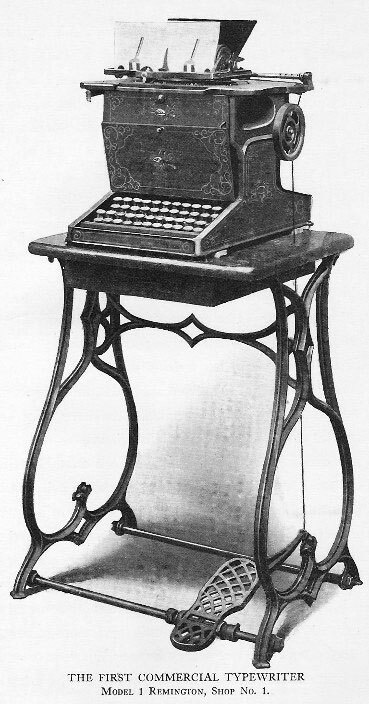 Malling-Hansen (see the nearby image) arranged the most frequently-used letters to be pressed by the fastest writing fingers, with consonants to the right and vowels to the left. This arrangement, along with the placement of the letters on short radial pistons, made the Writing Ball a very fast speed typing machine. The type is printed on a paper surface by means of carbonized paper or a ribbon. On the original model, the paper was attached to a cylinder, which moved by the help of an electromagnetic battery, making the writing ball in principle also the first electric typewriter. The first commercially successful typewriter was invented in 1867 by Christopher Sholes, Carlos Glidden and Samuel Soule from Milwaukee, Wisconsin (US pat. №79265). Later Sholes and Glidden being too frustrated by slow sales sold their patent to Densmore and Yost ((for $12000), who made an agreement with E. Remington and Sons (a famous manufacturer of sewing machines), to commercialize the machine as the Sholes and Glidden Type-Writer. In March, 1873, Remington began production of its first typewriter. It had a QWERTY keyboard layout, which because of the machine's success, was slowly adopted by other typewriter manufacturers. The first Remington typewriters even came with a foot pedal (just like sewing machines) to control carriage returns. Acceptance of the typewriter was slow initially, but it was facilitated over the next several years by various improvements like: the shift key, which made it possible to type both capital and lower-case letters with the same keys (1878, in the Remington Model 2 typewriter); printing on the upper side of the roller (1880); the tab key, permitting the setting of margins (1897), etc. Thomas Edison patented an electric typewriter in 1872, but the first workable model was not introduced until the 1920s. So how did we get to where we are now, in the high-tech age of computers and plastics? 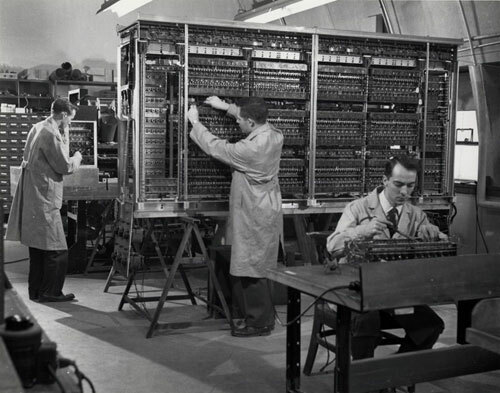 First computer keyboards were adapted from the punch card and teletype equipment. Herman Hollerith developed the first keypunch devices, which soon evolved to include keys for text and number entry akin to normal typewriters by the 1930s. In 1948, the Binac computer (see the lower image) had a Typewriter-Keyboard Unit. The keyboard had eight keys, representing the octal numbers (from 0 to 7), and was used to introduce either the program or data into the computer and memory. 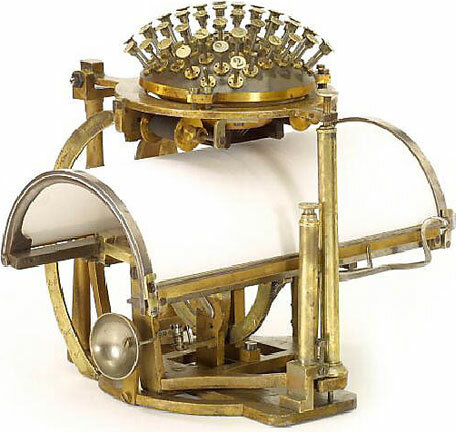 The electro-mechanically controlled typewriter was used to print the data, entered from the keyboard and data, contained in designated portions of the memory. From the early 1940s until the late 1960s, typewriters were the main means of data entry and output for computing, becoming integrated into what were known as computer terminals. In 1954 at MIT, researchers begin experimenting with direct keyboard input to computers. Until then, computer users fed their programs into a computer using punched cards or paper tape. Douglas Ross, a Teaching Assistant in the Mathematics Department, wrote a memo advocating direct access in the beginning of 1955. He believed, that a Flexowriter (an electrically-controlled typewriter) connected to an MIT computer could function as a keyboard input device due to its low cost and flexibility. Thus in 1955 MIT's Whirlwind, becomes the first computer in the world to allow its users to enter commands through a keyboard and confirmed how useful and convenient a keyboard input device could be.